Pakicetus is an extinct genus of cetaceans (this is the group containing whales, dolphins and porpoises). 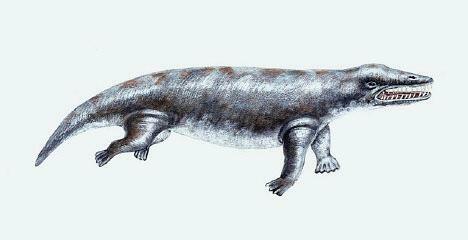 However, unlike modern cetaceans, Pakicetus was a land animal, and legs rather than flippers. Pakicetus was about the size of a wolf. and lived in what is today Pakistan, but at the time was the shore of the Tethys Sea (separating Africa from Asia). Pakicetus inhabited this area during the early part of the Eocene epoch, perhaps between about 56 and 50 million years ago. Complete fossil skeletons of Pakicetus have been found, so quite a lot is known about the animal. The reason it can be definitely identified as a cetacean, and not part of some other group, is that the skeleton's inner ear includes features which are characteristic of, and unique to, cetaceans.